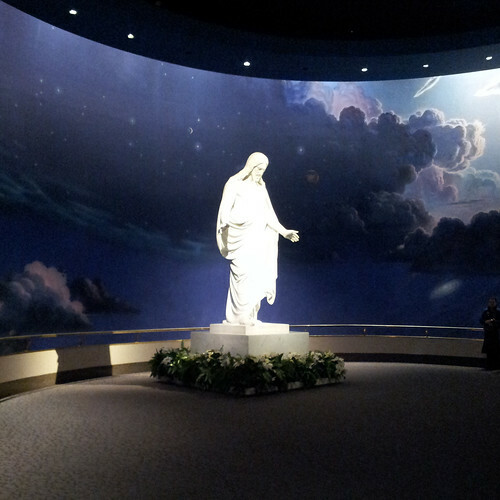 One of my favorite traditions for December is our trip to Temple Square in Salt Lake City. Clint and I moved away from family four years ago and this is our annual Christmas trip each year to spend time with family. We want the kids to understand the true meaning of Christmas, so we take them to see the Christus Statue in the Visitor Center. They also put on an amazing story of the birth of Christ with a life size nativity. The fun part about this trip is we get to stay in a hotel in Salt Lake, the kids love it - they appreciate being able to watch a little Disney Channel too ;) I had to take this picture because my little guy has to do everything his brothers do - they just melt my heart! 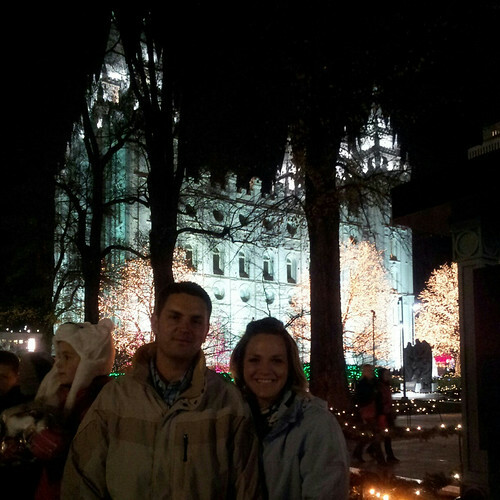 The lights on Temple Square are so beautiful, if you ever make it to Salt Lake in December it is worth checking out. My Instagram pictures do not give this place justice. Me and my mom at a family dinner. I love this lady! It is so hard living far away from her, but I am grateful for the times we are together. The best part of the trip is being with family. 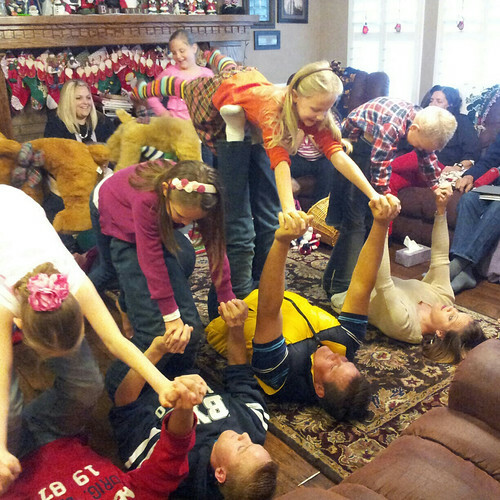 My nieces and nephews have so much fun with their aunts and uncles. I come from a big family, so when we get together we take up a whole room (plus more) and it is absolutely loud and chaotic, but it is the best sound in the world! It is these moments that mean the most to me. I hope that during this Christmas season you are able to spend time with those you love. I plan on hugging my kids more and being grateful for the blessing they are in my life. With recent tragic events it has made me think twice about letting any moment go by without letting my kids know how much I love them. I am glad to see we aren't the only family to have contest to see who can keep their kid in the air the longest :) Looks like a fabulous visit!! I love all of the stockings lined up on the mantle! Happy Holidays! Thank you for all your inspiration. All the best to you and yours! Thank you for a real yet magical post, I had tears in my eyes. Oh my goodness look at all the christmas stockings in the last picture! Your family photos made me smile, Merry Christmas! Wow, Temple Square is gorgeous. I hope I can see it in person someday. Wishing you and your family a wonderful holiday season. Such beautiful pictures and sentiments. Christmas truly is about the important people in your life. Gosh, those pictures brought back many fond memories for me. You are so correct; we need to love on our children much more. We should really tell those we love them as much as we can. Merry Christmas ! 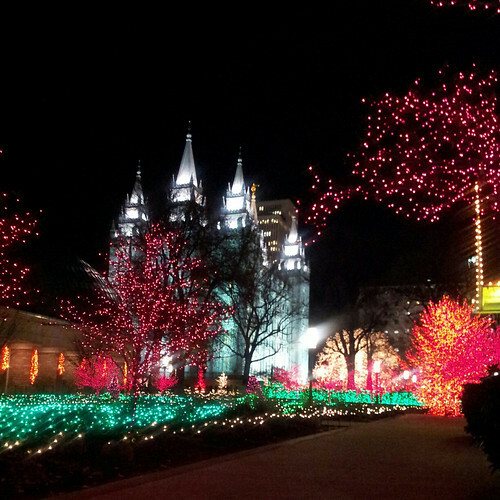 Beautiful pictures of the Temple with all the lights, my visit to SLC was in the summertime. Love all the stockings lined up, yes, we all can be a little nicer. I'm flying to AZ to spend Christmas with my 78 yr young father. Merry Christmas to you and your family. Thanks for so much inspiration and motivation in 2012! It's appreciated. Great post Judi. I used to do that with my kids, put them up in the air on my feet. I'm going to do that with my grandkids - thanks for the reminder. Merry Christmas! The joy just flows from the page. What a fun and wonderful experience for your boys. And your family looks like the craziness that is mine, lol! Merry Christmas Judi and a wonderful New Year too! Living in Central Utah has been a wonderful experience. We have not made it to Salt Lake City in December yet. I just found your wonderful blog. You are so creative and inspiring. Merry Christmas to you and yours from Glenwood, Utah. 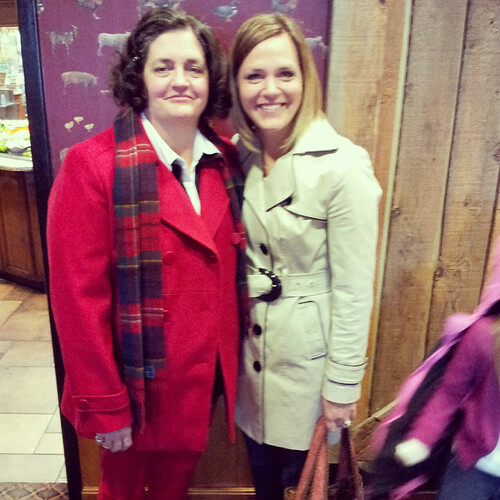 Merry Christmas to you and your family, Judi! You have a lovely family Judi, thanks for sharing your pictures, it's so nice that all your family get be together at Christmas.